Wal-Mart Wine: Save Money. Drink Better. In these dire economic times, with retail sales plummeting and forecasts for a bleak Holiday season, it’s really no surprise that only one major retailer seems to be weathering the tough times just fine. Yeah, big surprise that Walmart is coming up selling like a rose at a time when consumers are watching every penny they spend. Now, whether you love ‘em or hate ‘em, Walmart, with its undercutting low prices, is a godsend for people who can’t afford to do without those everyday staples and essentials that the retail giant is famous for providing to a large portion of the American population. Whether its toilet paper, diapers, or pantry staples, Walmart will make your pocketbook stretch amid skyrocketing prices everywhere else. And while we might be holding off on that LCD TV or automobile, we don’t have to curtail all vestiges of the finer life. And leave it to Wal-Mart to step in and fill the void with the introduction of Oak Leaf wines, sold exclusively at Wal-Mart. Wal-Mart wine, you say? Well, believe it or not, this house brand vintage is getting surprisingly favorable reviews, especially for a wine that sells for about $3 a bottle. And, not unlike Trader Joe’s famous Charles Shaw wine, better known as Two-Buck Chuck, Wal-Mart’s Oak Leaf is surprising not only the bargain hunting wine lover, but also some supposedly more discriminating palates. 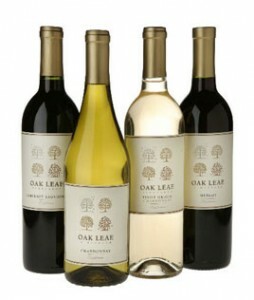 The wines are made exclusively for Wal-Mart by Oak Leaf Vineyards in Ripon, Calif. Oak Leaf is part of the Wine Group, the country’s second-largest wine company. Oak Leaf wines are made by Turning Leaf Vineyards winemaker Mario Pulido. They are nonvintage, which gives the winery greater leeway in using grapes. Most are on the low side for alcohol, about 12 percent. In a recent article in the Dallas Morning News, the Oak Leaf chardonnay won a gold medal at both the 2008 San Francisco Chronicle Wine Competition (chardonnays under $14.99) and the 2008 Florida State International Wine Competition. The Oak Leaf merlot and cabernet sauvignon earned bronze medals in the San Francisco contest. Those accolades prompted the newspaper to conduct its own taste test. We put Oak Leaf wines to the test with Dallas wine drinkers. We assembled a tasting panel in the upper sanctum of Adelmo’s that included friends and regular customers of the restaurateur with a range of tasting expertise, from casual drinker to a former wine-and-spirits store owner. So, what does this mean? Nothing, really, other than wine is a purely personal and subjective experience and no matter how sophisticated you may fancy yourself, taste does not always correlate with a higher price. Target showed that with fashion, maybe Wal-Mart can do that with wine? OK, maybe not. Besides, they’re masking their wine by labeling it Oak Leaf. I would’ve preferred it to have a Sam’s Choice label. Now, that would make buying the wine the ultimate in cheap chic. Yep. Another Wal-Mart customer is created. One bottle at a time. Perhaps he was emulating the logo of Hooters, one of his last remaining sponsors. Because as implausible as it seems, troubled golfer John Daly says he sleeps with his eyes open when he’s tired and drunk. And that’s what caused the misunderstanding last week when he was found outside a Winston-Salem Hooters restaurant extremely intoxicated and uncooperative, according to local police. He was taken to the county jail to sober up. In a telephone interview with the Associated Press on Nov. 2, the two-time major champion said the incident could have been avoided if his friends had realized he tends to sleep with his eyes open when he’s tired, stressed and has been drinking. He said the driver of his private bus, parked near Hooters, panicked when he saw Daly and called the paramedics. He has made only five cuts in 17 starts on the PGA Tour, his best finish a tie for 40th in the Viking Classic after rib surgery. He currently is No. 774 in the world. Daly hired Tiger Woods’ former swing coach Butch Harmon at the start of the year, but Harmon quit after a week in Tampa, Fla., when Daly spent a rain delay in a Hooters tent, then returned to play with Tampa Bay Bucs coach Jon Gruden as his caddie. Apparently, Daly doesn’t have the same work ethic as Woods. Because he was drunk! Isn’t denial one of the traits of addiction? Oh, don’t be so sure. Because America loves a lovable drunk. And maybe Hooters feels Daly, in all his train-wreck glory, is the quintessential representative of their core clientele and will keep sponsoring him. Now, if he can figure out how to win a golf tournament while drunk, sleeping with his eyes open, he just might be on to something special. And Hooters will sell more chicken wings.